Stories about the people, places and organizations in the North Carolina environmental education community. Congratulations to Gretchen Stokes for completing the NC Environmental Education Certification. Gretchen is a PhD student in ecology at the University of Florida, where she also serves as a National Science Foundation Graduate Research Fellow. Gretchen studies movement ecology, tropical ecology, and global biodiversity conservation. As a scientist, Gretchen had years of academic coursework in ecology, but little teaching experience. She said she pursued the program because of her interest in gaining hands-on experience as an educator. Gretchen found the Methods of Teaching Environmental Education workshop to be the most helpful part of the program. "I learned a lot about inquiry-based teaching, group facilitation, and group management while teaching in the field." The networking aspects of the certification program were also a highlight. "I enjoyed the diversity of workshops...and getting to meet a diversity of instructors, educators and others who I might otherwise never have run into." 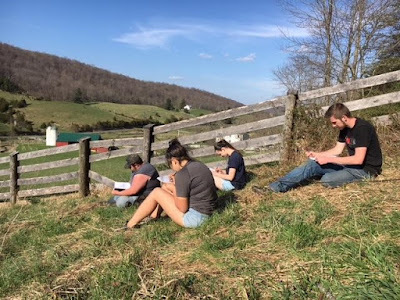 Gretchen conducted her community partnership project on a farm in Catawba, VA, a rural community near Virginia Tech. At the farm, she worked with Dr. Mary McDonald, a veterinarian who runs a training program called FARM. FARM stands for "Farm Animal Refresher for Missions." The one-week programs provide training in animal health care for veterinarians and veterinary students going on mission trips to developing countries. Gretchen noticed that the trainings had no environmental component, so she worked with Dr. McDonald to create trainings that would prepare veterinarians to lead mission projects that combine farm animal health and environmental health. Gretchen also developed curriculum for an aquatic ecology and conservation lab for local college students who visit the farm. 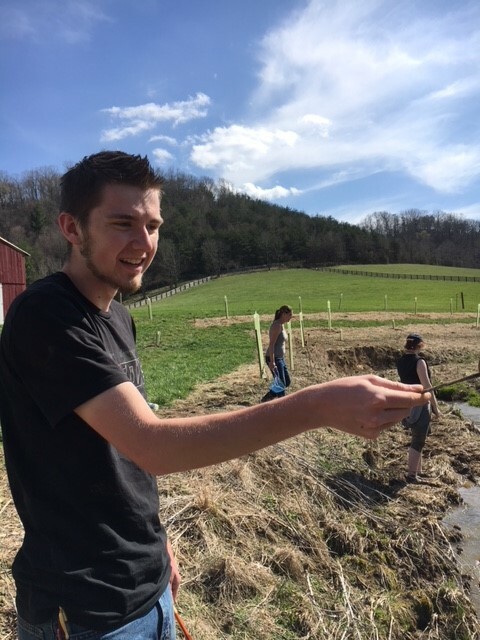 During the field course, students conduct water quality testing and biotic sampling in Catawba Creek, a stream that runs through the farm. Students also take part in a discussion of the role of humans as stewards of the earth, and record their reflections in nature journals. 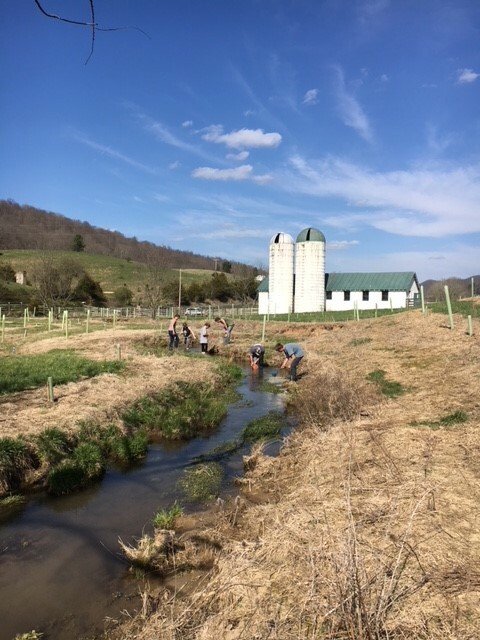 During the farm's first field course, students helped plant over 300 trees along Catawba Creek to serve as a riparian buffer. As Gretchen said, "This will not only improve water quality for a small section of Catawba Creek, but it will provide a working example to neighboring farms and other residences in Catawba Valley about how to have cattle and protect the stream. Hopefully having this as a model stream for improved conservation efforts will have a ripple effect." A survey after the first field course showed successful results. "In the post-teaching evaluation, almost all students reported that the course helped them think more about the environment and that they are more motivated to change their behavior in at least one way to benefit the environment," Gretchen said. Recently, Gretchen returned from teaching the second year of the aquatic ecology field course. 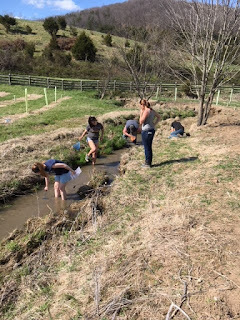 The students did some maintenance on the riparian buffer, as well as another round of water quality sampling, physical stream measurements, and biotic sampling. Reflecting back on the weekend spent at the farm, Gretchen explained the impact of the course. "Many of these students have never spent time doing anything related to field biology so it's really cool to see their interest grow as they spend time outside. Some even, at the end of the day, approached me asking how they could pursue a career in environmental science or biology." To learn more about the NC Environmental Education Certification, visit the NC Office of Environmental Education website. Comments to this site are subject to the N.C. Public Records Law and may be disclosed to third parties. Please identify yourself in posts. Off-topic posts, "spam" or posts with offensive or inappropriate language will be removed. The N.C. Office of Environmental Education and Public Affairs provides an environmental education clearinghouse, or central source, for all of the environmental education resources in the state. The office manages the N.C. Environmental Education Certification Program and serves as a liaison to the N.C. Department of Public Instruction. The office serves PreK-12 schools, colleges and universities, government agencies, non-profit organizations, environmental education centers, citizen groups, business and industry, libraries and the general public. The office is part of the N.C. Department of Environmental Quality in Raleigh. The Office of Environmental Education and Public Affairs, N.C. Department of Environmental Quality. Posts & comments to and from this blog are subject to the NC Public Records Law and may be disclosed to third parties. Comments welcome. The office reserves the right to remove off topic, offensive or inappropriate comments.